All transactions are safe and secure with a reliable history in online purchasing behind each of our associates. Buy the Hoverboard Replica Back to the Future Prop to own Back to the Future clothing and merchandise. This is your chance to buy a hoverboard replica prop that looks like the real thing. 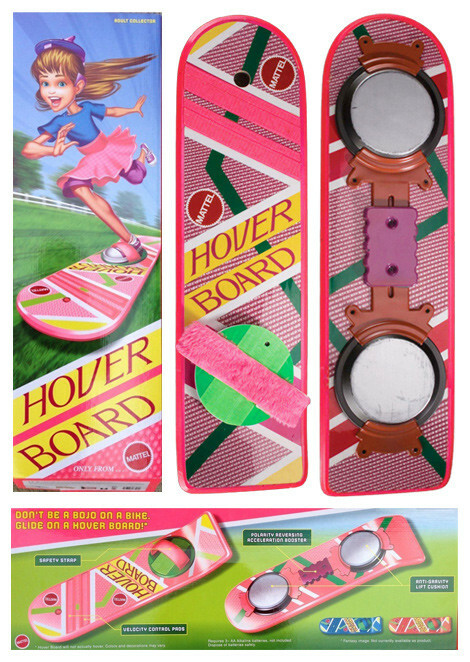 Unless you're buying the Official Mattel Hoverboard pictured, be sure to research each seller's boards, as some are crafted from foam while others are made from high quality plastic. Also, some of the Mattel Hoverboards ship with a mini hoverboard and some don't. Read the seller's description or ask the seller. Note, the majority of the replicas listed are not hoverboard skateboard decks. These are meticulously recreated props that are meant for display, offering unobstructed detail that closely mirrors the original from the movie. In addition to the Hoverboard Replica Back to the Future Prop above, browse the Back to the Future Clothing Gallery for more apparel like men's and women's clothes, kids shirts or hoodies.